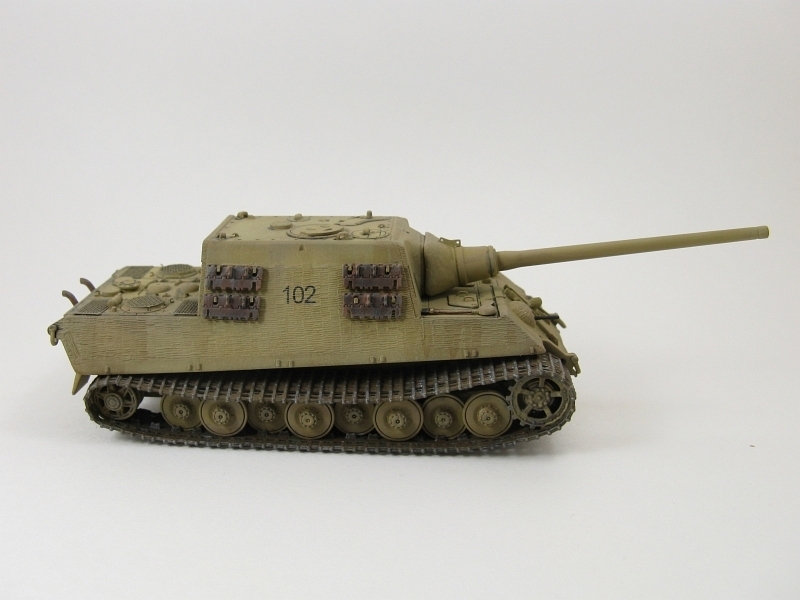 The Jagdtiger has always been one of my favourite armoured vehicle subjects. 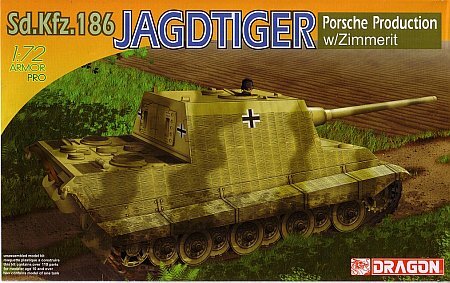 I have been wanting to build this kit for over a year now, but I also wanted to make a fairly accurate Jagdtiger and until I could find more information on the Porsche versions and their use in combat I was willing to wait until the time was right. Fortunately I recently discovered that a fellow armour modeller in my local club possessed a copy of the Münch book detailing the history of s.Pz.Jg.Abt.653 and was willing to loan it to me for awhile. 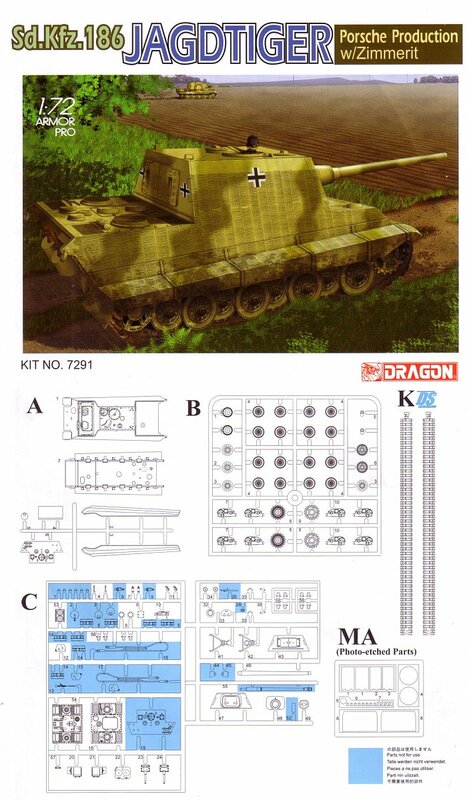 With this excellent reference at hand I proceeded to try my hand at building not only a Jagdtiger but one with DS tracks, something I had never tried before. 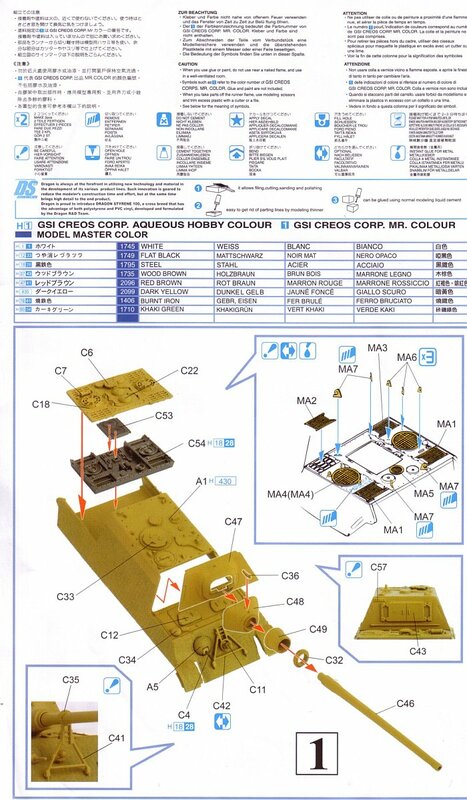 Inside the box you get 125 beautifully molded light grey parts, exhibiting no flash and hair fine cast lines, two runs of Dragon's trademarked DS flexible tracks in a light tan colour, an etched brass fret containing 21 exquisite parts, a small decal sheet and an instruction sheet printed in colour on glossy paper. Decals cover six marking options, all for s.Pz.Jg.Abt.653. 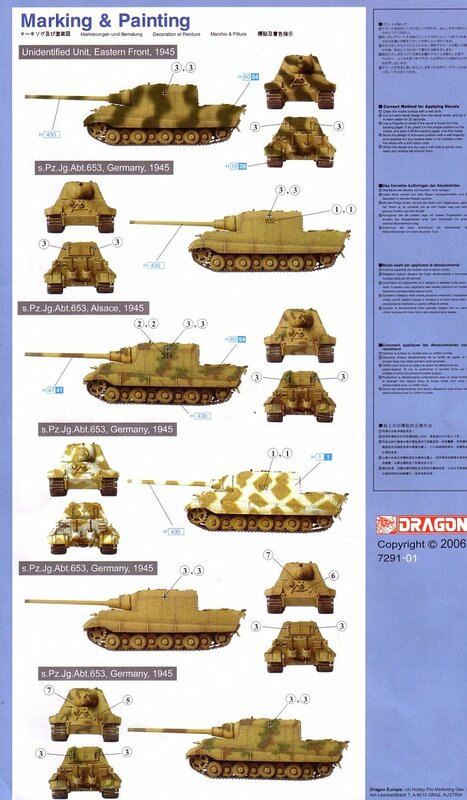 Now, not being a Jagdtiger expert in any sense, I would like to offer some comments on the markings supplied by Dragon as compared to what I could find in the Münch book. My comments will be enclosed in square brackets following each option listed below. C56 (tow rings). Dragon has included 12 of these but you only need four. All these extra parts made very welcome additions to the parts box. Dragon provides the option of mounting the gun with the travel lock on the gun barrel (part C41) or not on the barrel (part C42). Whichever option you choose you can dispose of the other unused travel lock. 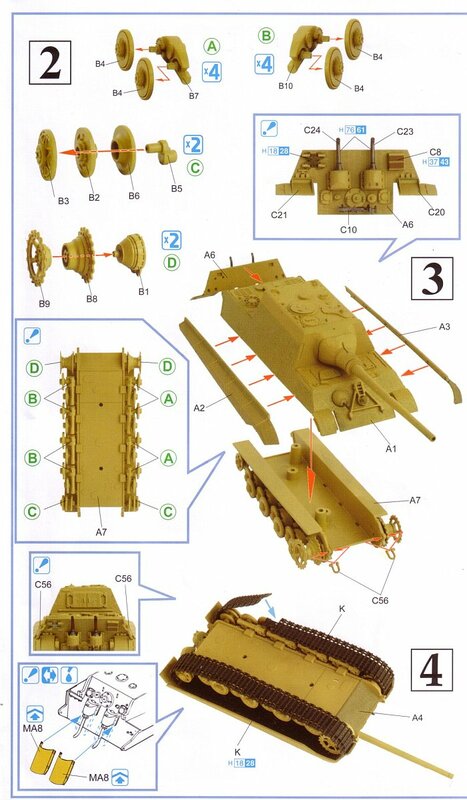 As indicated in the sprue layout the spare track links are not to be used, which is debatable. If you wish to build Jagdtigers 305009 and 305010, photographs in the Münch book actually show these two vehicles with spare tracks. If the spare tracks are left off the side of the casemate, there is the problem of what to do about the very prominent hangers used to hang the spare tracks, which would be visible when the tracks are missing, but are not provided by Dragon. After a lot of perusing and reading of the Münch book I settled on trying my hand at modelling black 102 of the Stab unit of schwere Panzerjäger-Abteilung 653. With no photographic references in the book on this particular vehicle before its destruction, I figured 102 would make the perfect subject as I could build it as I wanted/desired with not too many worries about it having to match what was seen in some photograph. Outside of the marking doubts and the spare tack issue, this is an excellently molded kit and would make a great model straight from the box. Some engine detail is included on parts C53 and C54 but it pretty much disappears after the deck (part C18) and all the photo-etched screens (parts MA1, MA2 and MA4) are in place. One thing took look out for is Part C54, which is too long by about 2mm and prevented the rear panel (part A6) from fitting. I discovered this after I had glued it on the hull so I had to trim it in place. The trimming must be done at an angle that follows how the rear panel mounts. There are very few ejector marks to worry about. The only marks I had to deal with, because they would be obvious, were the ones on the jack (part C10) and on the mantlet lift point (part C36). The fine mold seams were easily removed with a quick scrape from a hobby knife or by a little sanding. A bit of extra detailing was done to make Dragon's excellent effort just that much nicer and to make it how I wanted it to look. I did not add side skirts. Most pictures show them removed so I did the same. As a result I had to scrape off some of the Zimmerit from the bottom edge of the hull. Photographs show that the Zimmerit was not applied below the line of the skirts. I also added the skirt mounts from pieces of square plastic rod. I did not add the photo-etched exhaust shields. Even though the exhaust pipes already had holes in their ends I deepened them with a drill. I added a shovel strap to the left front hull. 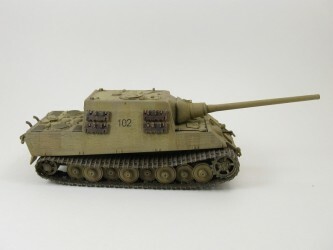 Early Jagdtigers had different gun braces than later Jagdtigers. 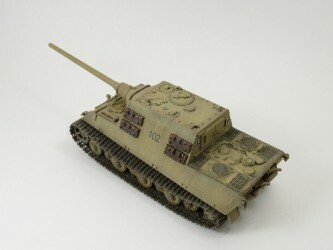 I made an executive decision that black 102 was an early Jagdtiger, so I removed the piece that runs between the two angled rods on part C42. The small round pilsen points were removed from the roof. Apparently the Porsche Jagdtigers did not carry them. Drilled out the periscope hole. Replaced molded on handles on the hull and turret hatches with pieces of wire bent to shape. Drilled out the holes for the lift hooks on the roof. These were molded as small semi-circular bumps. Even though the gun barrel has a hole already in place I deepened it some more with a drill bit. Drilled out the barrel for the hull MG.
Added spare track hooks. I was unsure about how to go about doing this and after much thought settled on this method. After the tracks were super glued in place, I pre-painted some small sections of rod and super glued them inside the holes in the links. These were then trimmed down to be flush with the tracks and then I added tiny bits of pre-painted square rod on top to replicate the hook portion that would be exposed. Added electrical conduit to the front light from a thin piece of wire. Shaved off the molded on tools and replaced them with separate items from the spares box. Replaced the molded on vision blocks on the roof with some cut from an Italeri Jagdtiger. The two large holes on the bottom of the hull were filled and sanded smooth. My understanding is these are relics from Dragon's earlier releases with screw together hull parts. The decals are perfect. The images were well printed, the transfer film was nice and thin and they went over the molded on zimmerit without any fuss. Just a couple of soakings in Microsol solution and they settled down well enough to look like they've been painted on the model. I had never before used Dragon's DS style tracks which was another reason for my delay in building this kit. After conferring with various modellers I decided to mount the tracks with what I will now call the Treadway/Barker method (named after Tim Treadway, fellow Braille armour modeller, and Cam Barker, local club member and a superb 1/35 scale armour builder) for attaching the tracks. Glue the tracks together using MEK (methylene chloride). Use a light application of MEK to make sure they don't melt (MEK is very strong) and then let them sit overnight to dry thoroughly. Assemble model and add bogies and idler wheel, but leave off the drive sprocket. Give the tracks their base coats of paint (in my case this was flat black undercoat followed by a lighter top coat of dark earth brown) and paint the body, wheels and drive sprocket. Then I sprayed a coat of Gloss Cote on the tank but not the tracks. Loosely place the tracks and sprocket onto the kit. 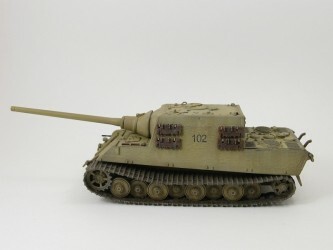 For the Jagdtiger I placed the join in the tracks at about the 2 o'clock position on the idler wheel which nicely hides what little seam there is at the join plus places the seam on a spot where it touches the wheel to give it more support when the tracks are glued in place on the suspension. Lightly clamp kit to a flat surface. I used a piece of aluminum plate for this. Add spacers to create any needed sag and have top run of the tracks touch to top of the bogies. I used some wooden pieces cut from some clothes pins. Glue tracks to bogies, idler and drive sprocket using MEK. - (I did have to use some super glue along with the MEK on the front most wheels to ensure they wouldn't separate. There is a fair amount of tension in the tracks at this point). Let sit for a day. The MEK easily penetrated the paint layer and gave a nice tight join to the wheels. Apply decals and then weather the kit and tracks. Spray on the flat coat over both the body and tracks. The DS tracks were a pleasant surprise and glued together easily with MEK. As far as painting is concerned, I will have to try using acrylics on the next set I build. Enamels just didn't like a lot of handling and rubbed through a few times requiring a touch up here and there. The only thing I really didn't like about the tracks was their flexibility which caused them to move around too much when I tried rubbing some pencil lead over the raised portions of the track links. All that flex didn't allow me to press down hard enough to transfer the graphite to the tracks, which wasn't an issue when I tried this on the hard plastic tracks of my Trumpeter Ferdinand. In the end I dry brushed them lightly with a mix of Testors chrome silver mixed with some flat black. A small set of lift hooks for the engine deck (parts MA7 & MA6) are supplied as etched brass pieces. These are best left off until after the painting is done. I sprayed them while they were still attached to the fret then super glued them to the kit and touched them up with some paint where it chipped off as I was applying them to the kit. Well, in the end I'm happy with my first try at Dragon's DS tracks, and my first Dragon kit overall. I think that another DS tracked vehicle may be in my future soon. And this is also the first vehicle I have painted entirely using my new Aztec airbrush. My old faithful Badger 350 will still be kept for other uses and as a backup but the Aztec will now pretty much replace it for most painting tasks. Just need to work on the dexterity a bit! Various web sites located via Google search.